Airplay receiver for PC, Mirror iPhone/iPad/iPod to Windows, record iOS screen on Windows PCeen on your computer. AirPlay receiver is transforming the way we use our iOS devices. Windows users can now wirelessly mirror iPad/iPhone/iPod Touch screen, stream audio, video, slideshow, etc. to their Windows PCs with the AirPlay Receiver for Windows - X-Mirage. X-Mirage is a completely portable application that runs on Windows PC and broadcasts your PC as an AirPlay destination. Who will need an AirPlay Receiver for Windows? What are the benefits of getting an AirPlay Receiver for Windows? Install and run X-Mirage on your classroom Windows or Mac, then you can mirror your iPad and students' iPads screen to the bigger screen for presentation, share or discussion. If the Windows or Mac is connected to a projector, then the iPads screen show on the projector in real time without lag. Have you ever thought of showing off your iOS apps on a bigger screen? Connect your iOS devices to your Mac or Windows via AirPlay Mirroring, and then operate on the iOS devices just as usual. Play video, music or slideshow on your iPhone, iPad or iPod, then click the AirPlay icon to stream the contents to the Windows or Mac running X-Mirage. Enjoy everything on the bigger screen with your families. iOS games such as Real Racing 2, MetalStorm, etc. 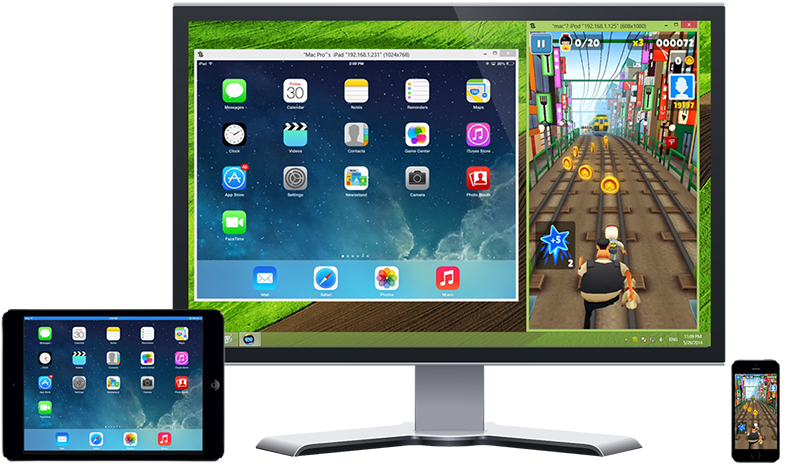 are AirPlay enabled and output different contents on your iDevice and AirPlay receiver: games are streamed to your Windows or Mac and iOS devices turns to be the game controller. With the built-in one-click recording button, it is extremely easy to record what is showing on the iOS screen. roring on your iOS devices, what is shown on the iOS device screen is mirrored to the bigger Windows PC screen and full-screen mode is supported. RTM enables a Systems Administrator to control most aspects of a remote environment. The simple-to-use, tabbed interface separates applications, services, devices, processes, events and performance monitor, making each of these very easy to control. Present your windows desktop online via Internet to any other user without any problems of firewalls. Transmit your screen content via Internet or Intranet for presentations, trainings, sales conversations etc. to one or several remote users. Net Monitor for Classroom is a program that allows a view of a computer monitor of a remote computer, which is connected to the network. After start the program displays the screens of all remote computers. Teacher can also lock the remote computers.